Firefox is in a state of rapid updates, when it seems every month brings a new version to your screen. In the vast rush to get new features out there, older features, perhaps considered no longer necessary, are dropped by the wayside. Fortunately, the extremely robust plug-in ecosystem and developer community that keeps Firefox my personal browser of choice (winning me back from Opera solely due to some add-ons I found I couldn't live without) means that if there's a feature you like, someone will add it back in if it's gone. 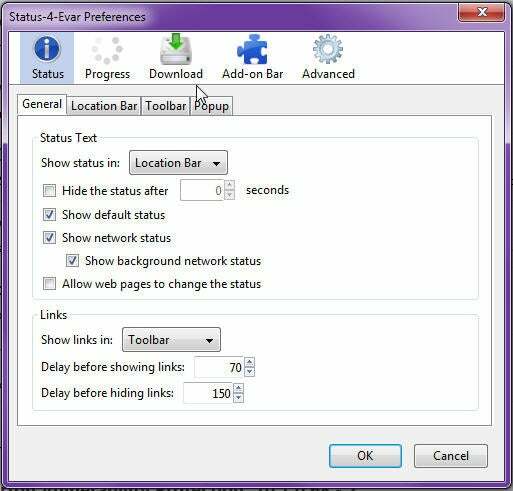 Thus it is with Status-4-Evar, which recreates the pre-Firefox 4 status bar widgets, but with improved flexibility. Status-4-Evar offers many ways to customize your display. If you don't want more things on your screen, of course, you won't want Status-4-Evar. If you do want this information, Status-4-Evar gives you an easy way to see it. Overall, I find it interesting but not vital; I didn't notice most of these features were gone until Status-4-Evar brought them back. If I have any complaint about Status-4-Evar's functionality, it's that it's not always entirely intuitive what an option might do or what to set to get the effect you want, but this is an issue easily solved with a few minutes of fiddling, or quick trip to the support forums. Last thought: There's the usual issue that no matter how few resources any given add-on may consume, the sum total of multiple small add-ons can be a cumulative drag on performance. iIt's always good to consider the cost of each straw you add to the back of the Firefox camel. Note: Clicking the Download Now button takes you to the Firefox add-ons page, where you can download Status-4-Evar into your browser. Restore some of the information lost in the name of Spartan interfaces with Status-4-Evar.